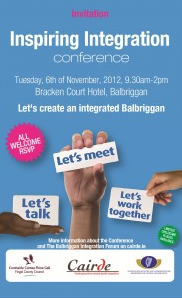 The Inspiring Integration Conference will provide an opportunity to share best integration practices from various regions in Ireland and internationally that could be implemented in Balbriggan. It will also provide a space for the service providers, decision makers, community leaders and residents to network and discuss challenges and successes experienced in our work and life and to draw up strategies for improvement. See Program details – International and Irish based speakers will share their expertise in areas such as education, employment, representation and community. How to participate in the conference: registration, childcare, parking etc. Please help us to reach out to everyone who might be interested in participating in this conference by circulating this email and displaying the poster attached.